We are looking forward to seeing everyone at our Open Morning Wednesday February 13th. Refreshments in the school hall first. We hope you will find the information on the website useful and that it gives you an insight into our school. If you cannot find what you wish to know please ring the school office and we will do our best to help. Our school has recently converted to become an academy and we are in process of updating all information on the web site to reflect this. A few families from our school joined families from Carlton Junior Academy to Ypres in France as part of a remembrance trip linked to WW1. We had a great trip and the children learned a lot from their visit to local cemeteries and battle fields in the area. 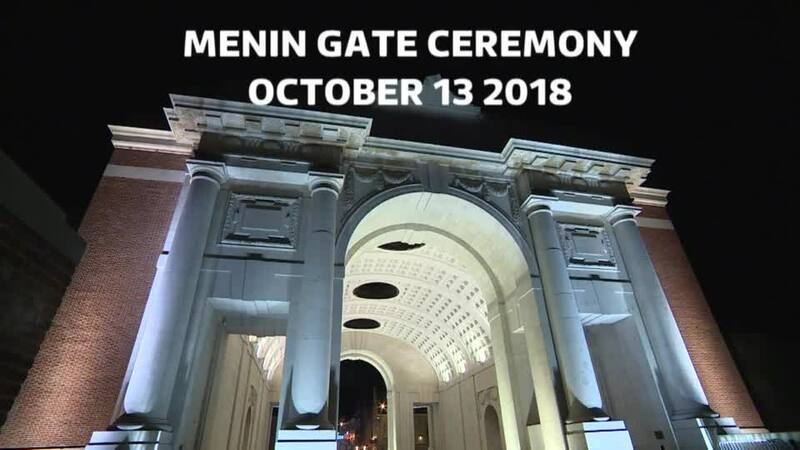 We were particularly proud to be able to lay a wreath at the daily Menin Gate Memorial. This was laid by Cllr John Parr who is a school governor (and also a former pupil), as well as 2 pupils from Year 5. Click on video link below to see the full clip. Hopefully it will play. In June Vernon Coker MP for Gedling came to visit our brand new Early Years Unit 'Little Herons' along with Andy Burns Executive Principal of the Redhill Academy Trust, Julie Wardle Executive Head of Carlton Junior Academy and Anna Spencer Head of Carlton Infant Academy. It was wonderful to show off our fantastic new early years facility which has been built to provide additional early years care for families in the local area. Our links to Nottingham and Cambridge University. As you know we are constantly working hard find different ways to excite and inspire your children. One of the ways that we are able to do this is by using our links with Nottingham University. This year we have already had 3 Science sessions held by students from the University with our Year 5 class. They learned about their bodies and how, particularly their mighty muscles and also germs how they spread. These inspiring sessions got the children learning in new and practical ways but also helped to raise their aspirations for going to University when they are older. The feedback from the children was very positive. Year 5 are also working with engineers from the Universities of Nottingham and Cambridge to create mechanical fingers so that 88 pianists can play the piano at once! This will be a new World record. We are now currently having visits from students carrying out Philosophy sessions with our Year 3 and 4 classes and carrying out a Science After School Club. Keep your eyes open for more opportunities this year. FOR COMMITMENT TO THE 'TAKE CARE' PROJECT. Well done to the winners of the Karen Award. Our new Early Years Unit for 2 to 4 year olds was officially opened on May 18th by the Chairman of the County Council Councillor Sue Saddington. Please see the link below for further information. Year 6 are thrilled to have pen pals at Morton Grange Care Home. They were very interested in finding out about dementia from the Manager of the Care Home. We have now made some new friends as we write to each other regularly. We were thrilled to meet each other in person at our tea party where we welcomed our new friends to our school. On Wednesday 7th March we had a visit from a local author. Daniel Henshaw came to talk to the school about being an author and writing mystery stories. He held an exciting whole school assembly and then worked with all 4 KS2 classes where they planned their own mystery stories. He was extremely busy signing books and having photos taken at the end of the day. This event really got the children excited about reading and writing and they were very proud of the stories they wrote. Maybe we have a future published author within our school!